More than 1,000 South Sudanese troops died during the battle for Sudan's main oilfield of Heglig, the Sudanese armed forces commander said on Monday, as a stench of death filled the air. "The numbers of killed from SPLM are 1,200," Kamal Marouf said during an address to thousands of troops in the area, from which Southern forces said they had withdrawn at the weekend. The toll is impossible to verify but an AFP correspondent who accompanied Marouf said the putrid bodies of dead South Sudanese soldiers lay beneath trees which are scattered about the area. He said the number of bodies was so large they were "uncountable". Corpses bore the South Sudanese flag on their uniforms. From the main road, destroyed oil company vehicles could be seen. There were no civilians visible, only Sudanese soldiers on patrol. 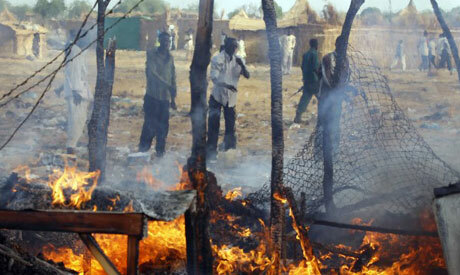 Sudan has not said how many of its own soldiers died in the operation. During its 10-day occupation of Heglig, South Sudan's army said 19 of its soldiers had been killed while 240 Sudanese soldiers lost their lives. Early in the occupation one Southern soldier in Bentiu, capital of the South's Unity State, said: "There are so many bodies at the front line, so many dead" that it is impossible to bury them or bring them back. Nafie Ali Nafie, a top aide to Sudan's President Omar al-Bashir, said on Sunday that the Southern death toll in the Heglig battle "amounted to 400," according to the Sudanese Media Center, which is close to the security apparatus. An AFP photographer earlier saw almost 100 Sudanese wounded being treated at a Khartoum military hospital. Sudan did not allow journalists or other observers into the Heglig area during the standoff with the South, which on Sunday said it had completed its pullout from the region. The move followed intense international diplomacy to pull the two sides back from the brink of a wider war. Khartoum claimed to have defeated the South and forced it out. South Sudan occupied the oil field on April 10, in a move that coincided with waves of air strikes against its territory. Sudanese warplanes launched a fresh bombing raid on Bentiu on Monday, in an attack witnessed by AFP that left a small boy dead. Each side has accused the other of damaging the oil infrastructure at Heglig, which accounted for about half of the north's production. "What South Sudan did in destroying infrastructure cannot go without accountability," Marouf said.